What is osteoporosis / osteopenia? Osteoporosis:when the strong bones with high mineral density(BMD) become porous, weak and thin it is termed as Osteoporosis or osteopenia. Due to this process of osteoporosis bones become more susceptible to fracture. As per Dr.Abhishek in osteoporosis condition not only bone mineral density (BMD) is reduced but it also alter various proteins present in the bone. Osteopenia also alter micro architecture of the bones. Women are more prone as their bones are light and thin as compare to male bones. Secondly, female experience change in hormonal levels after menopause that also contribute to the loss of bone mass. In males osteoporosis / osteopenia is usually seen after the age of 65. In India more that 6.3 million fractures are due to osteoporosis. As per a survey in United States of America-USA 26 million American population is effected by osteoporosis / osteopenia, of which 75% are female. Hormonal Changes: During menopause around the age of 45-50yrs, 35% of female experience bone fracture due to osteoporosis / osteopenia, It is due to hormonal imbalance during menopause. As per Dr.Swati, of Aura Homeopathy clinic & research centre oestrogen level in a female after menopause is 1/10th of the amount in pre menopause condition. 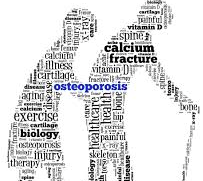 Hence post menopause females are more prone to develop osteoporosis / osteopenia. Estrogen helps absorption of calcium and maintain vitamin -D levels. More in those having family history. Frequent bone fractures, most commonly in the wrists, pelvis, hip, ribs and spine. Soya foods contain natural phyto-estrogens that are very useful in menopausal and post menopausal women. Dr.Swati advocate that homeopathy medicine must be selected on the basis of constitution of the patient, considering totality of symptoms. As per Dr.Swati homeopathy medicine are considered as best friend of women. Aura Homeopathy treatment should be started early as in early stage the pathological condition is reversible, where as in latter stages the pathological changes can’t be reversed. Though aura homeopathy treatment can help to decrease the intensity of suffering. As per a research study done at an NHS -Woman clinic in Sheffield-United Kingdom-U.K, 78% of 102 patients shows good improvement of menopause symptoms with homeopathic treatment. Help to reduce body aches and bone pain. Helps to reduce other symptoms and disease condition related to menopause.